Air Transport Economics through the game. A game with progressive difficulty levels and "trial and error" cycles. airECONsim is an airline simulation game for trainings in air transport economics and industrial organization. Players are responsible for managing the fleet and the pricing policy of virtual airlines competing over the same routes, and must adapt their strategies to a constantly changing environment (crises, airport congestion and regulatory changes, emergence of environmental constraints, development of a new aircraft, cost evolutions, new route openings ...). Note You can check the companion document while playing the tutorial. 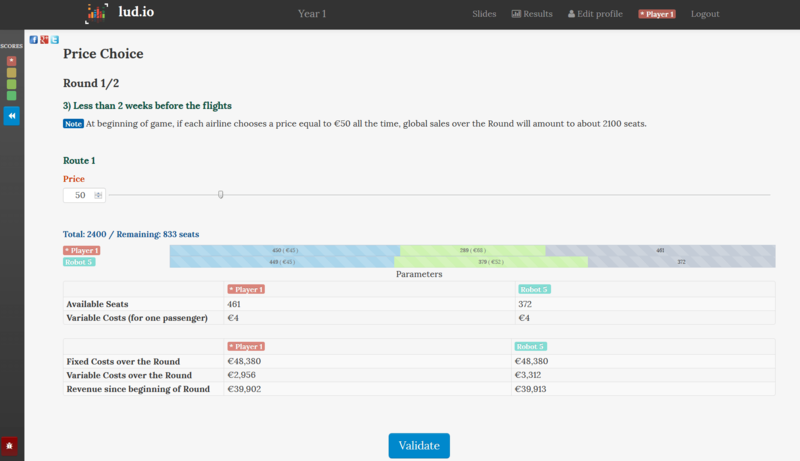 Understanding air transport economics through the game. The determinants of fleet choice. The effect of flight frequencies on passenger demand. Vertical Differentation and the low-cost model. The analysis of which costs are relevant for various decisions, in the short or long term (or how to avoid the sunk cost fallacy and not to base your thinking on average costs). Theoretic debriefing phases regularly occur during the game, to help players apply economic analysis tools to decision making. A flexible training program tailored to your needs. We regularly offer (distance or traditional) trainings on air transport economics or industrial organization, for all levels. The usual duration of training is two or three days for a standard scenario, in French or English. EU-ETS CO2 emissions permits management. Airport slot allocation for congested airports.